Look out, kale: Sweet potatoes (and yams) are everywhere right now. The knobby, luscious tubers are quickly becoming the darlings of the vegetable world. Here are five groups of folks who love sweet potatoes‚ and the reasons they do. The sweetness of yams and sweet potatoes hits all the right taste notes for the under-five set. Baked mushed sweet potato makes a perfect first food for baby; all the baby-food books (including my book Feeding the Whole Family) will tell you so. Battling with your toddler about the “V” word? Here’s one nutrient-rich vegetable that even the pickiest eaters might like. One of nature's unsurpassed sources of beta-carotene, sweet potatoes make all superfood lists. The orange flesh indicates a plethora of antioxidants are present. If you want to enjoy the full beta-carotene benefits of this root vegetable, be sure to serve it with butter, or roast the potatoes with olive oil. Eating fat with sweet potatoes significantly increases the body's uptake of beta-carotene from the tubers. Sweet potatoes make the Environmental Working Group's '“Clean list. That is so sweet. What it means is that sweet potatoes are one of the least pesticide-laden conventionally grown vegetables on the market. It’s still good to buy organic, but in a pinch, it’s OK to nab one from any grocery store. Nothing in the oven while watching the next episode of "Downton Abbey"? Don’t let it happen. Bake a sweet potato while you’re being a couch potato. Then, transform it into a warm breakfast  — pumpkin muffins, anyone? Or, for dinner throw together a soup or a salad with apples and kale. The golden-orange sweetness can even be made into a frosting (see below). The first traditional Thanksgiving meal featured “foods native to the New World.” And sweet potatoes are considered part of the club. 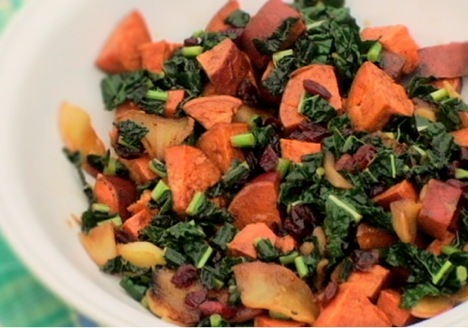 Either as a side dish (you don’t have to use marshmallows) or a dessert (think Sweet Potato Buttermilk Pie), the meal is not the real deal without the appearance of sweet potatoes. In fact, around 75 percent of home cooks include them as part of their Thanksgiving feast.